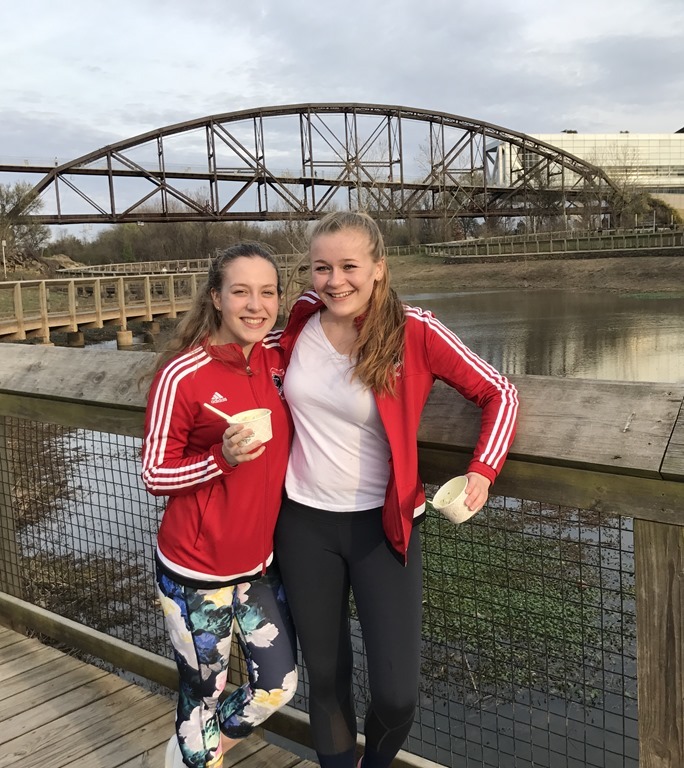 2017 has been all about preparing Aby & Annika to run their first marathon. I must admit when they said they wanted to run a marathon, I tried to talk them out of it. Marathons are long. And hard. And tough mentally & physically. The distance will frequently break experienced runners. The girls are young. Aby is 15 & Annika just turned 17. Yet they wanted to run a marathon. It was really hard to wrap my brain around. Its not something I would recommend for any teen, let alone those I know & care about! 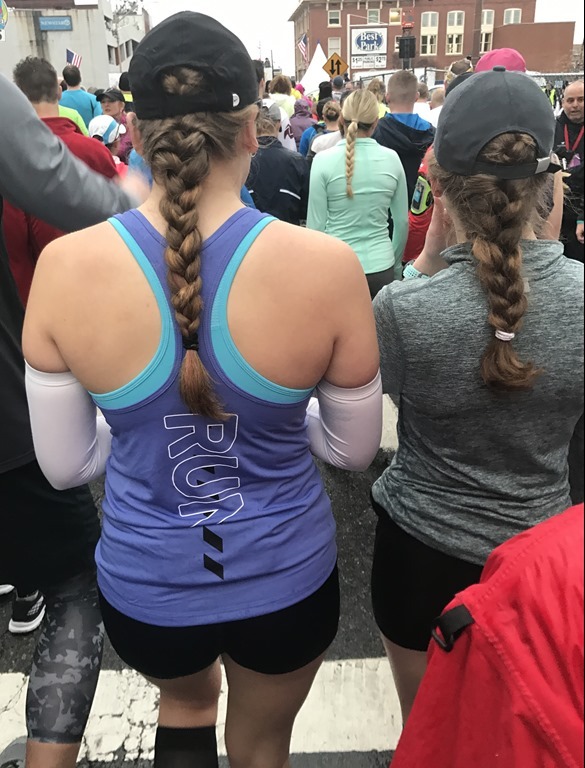 Initially I wasn’t sure how to react but I put on the “mom hat” and explained to them that an early spring marathon would require them to be running outside, all winter long, in the early a.m. when I was running. No sleeping in, I wanted them out there with me for every long run so I could monitor their progress, fueling & how they were tolerating the distance. They would not be deterred. 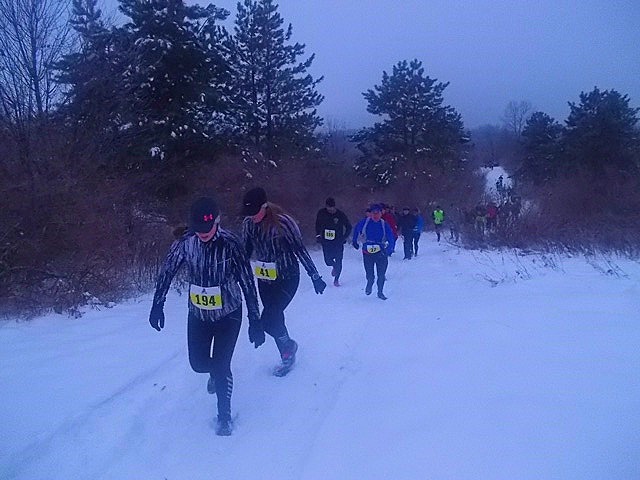 In fact their first “long run” was the Huff 10 Mile Trail Race which was hilly, hard, snowy, cold, with freezing rain. Absolutely miserable conditions. 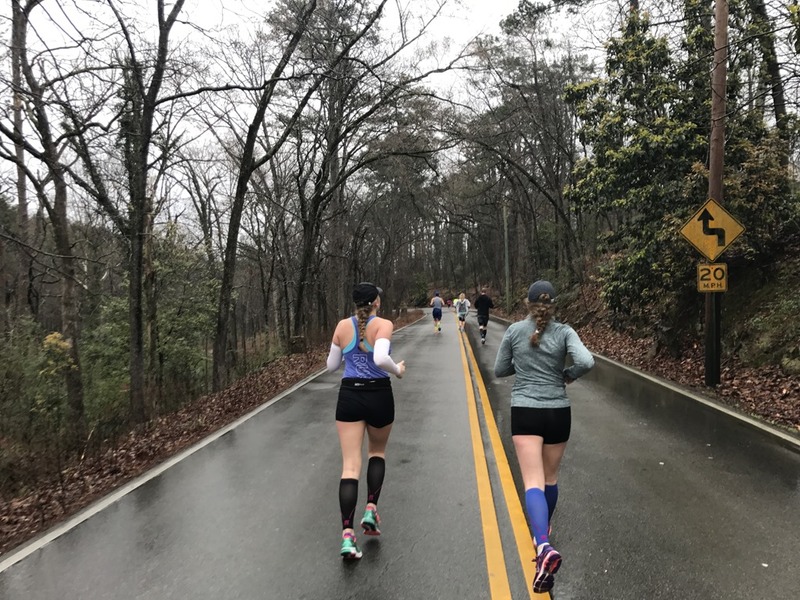 I asked them after Huff, do you still want to run a marathon that requires winter training? Yes. 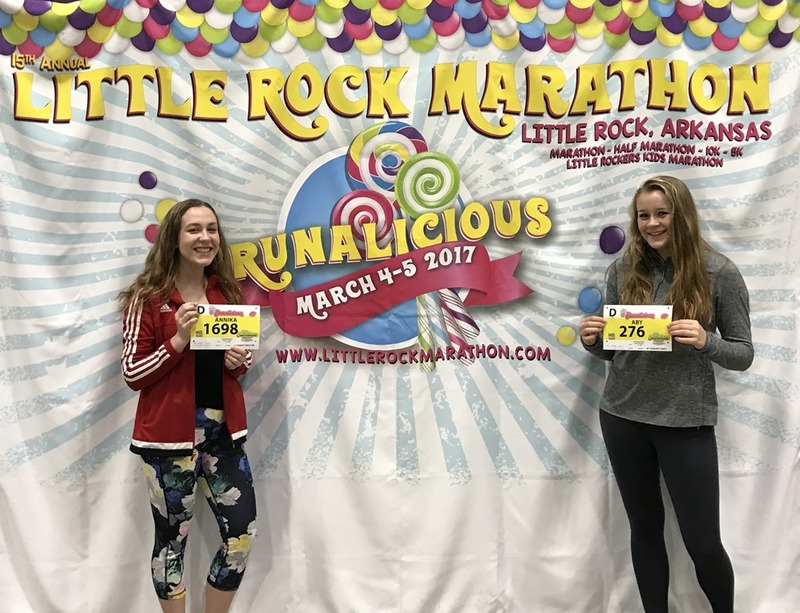 So we signed up for the Little Rock Marathon. 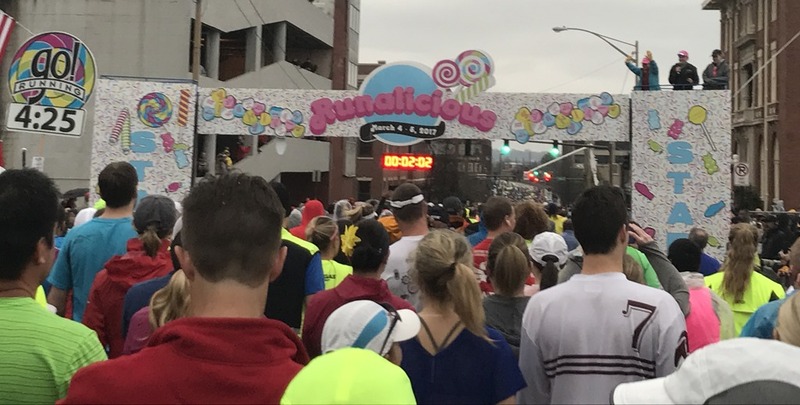 The 2017 theme was “Runalicious” featuring candy, bright colors and lots of fun. 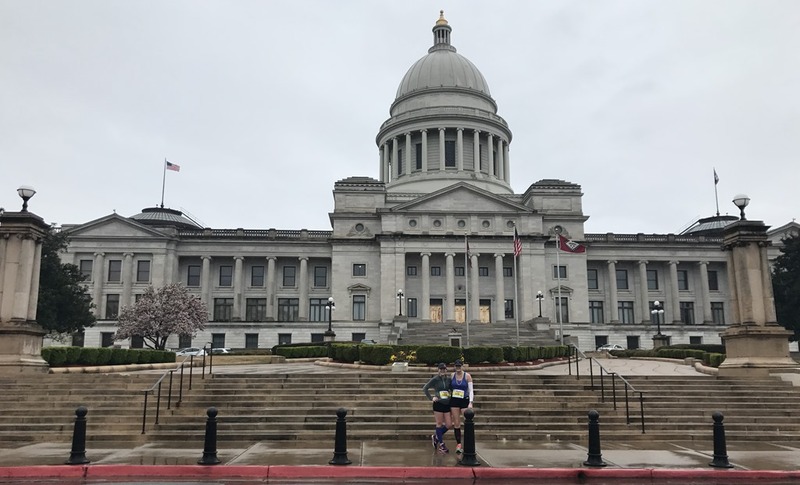 An abbreviated training plan & a somewhat mild winter delivered us to Little Rock mostly healthy & ready to run. The girls were slightly nervous but mostly calm. I heard them say many times “we trained for this, we can do it”. But they were notably tired from the travel so we tried to keep things pretty low key & not do much. The Expo was a great size for a small town race. 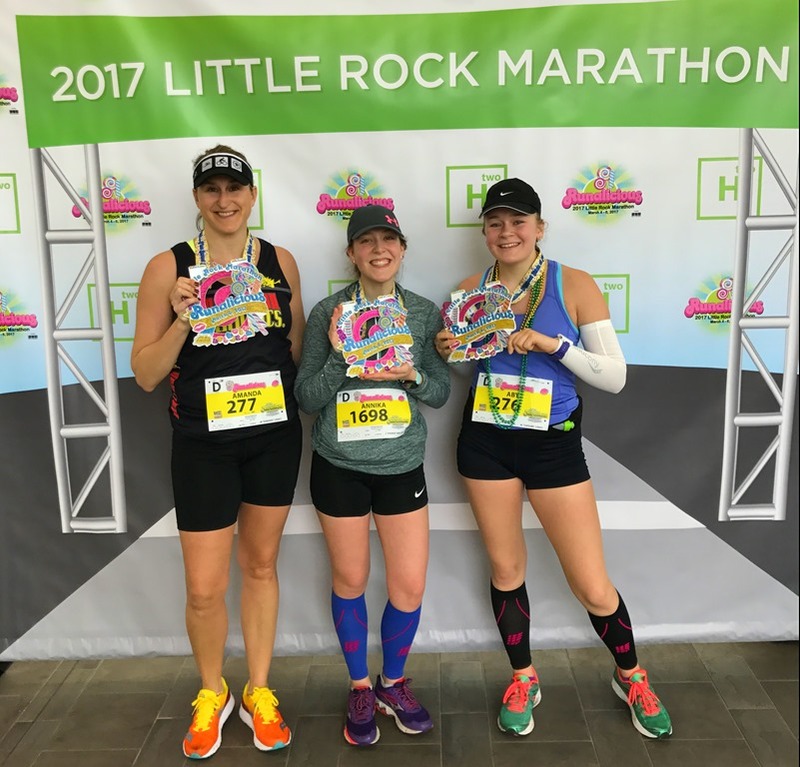 There were 2181 marathon & 3699 half marathon finishers on Sunday, plus a 5K & 10K on Saturday. Lots to do Marathon weekend . Something for everyone. We hit the expo, picked up our bibs, walked around town, found ice cream, took some pics & then had take out for dinner. I think we were all asleep by 9pm. We woke up to rain. Heavy but steady rain with a “feels like” temp of 43 as we headed to our corrals. We were none too early either because I didn’t want the girls out in the cold rain for too long before we started to run. I was a bit surprised to see how busy the streets were & the back up getting into the corrals. Pace wasn’t an issue for us but I really wanted to be around the 4:30 pace group because that was the pace where we would start out. I didn’t want to waste too much energy weaving around people in the early miles. We were on the “just finish it” plan but we wanted to stay together & I wanted to try to keep a consistent pace. I knew that I would have to be paying attention in order to keep them slow & steady. They are XC runners and they just want to GO! In the corral, headed to the start. What are they thinking? The beginning is crowded. Normal for most races & a great time to ease into a pace rather than take off and regret it later. Also a great time for pics. But apparently my selfie game was OFF cuz I couldn’t get all three of in a pic for anything. 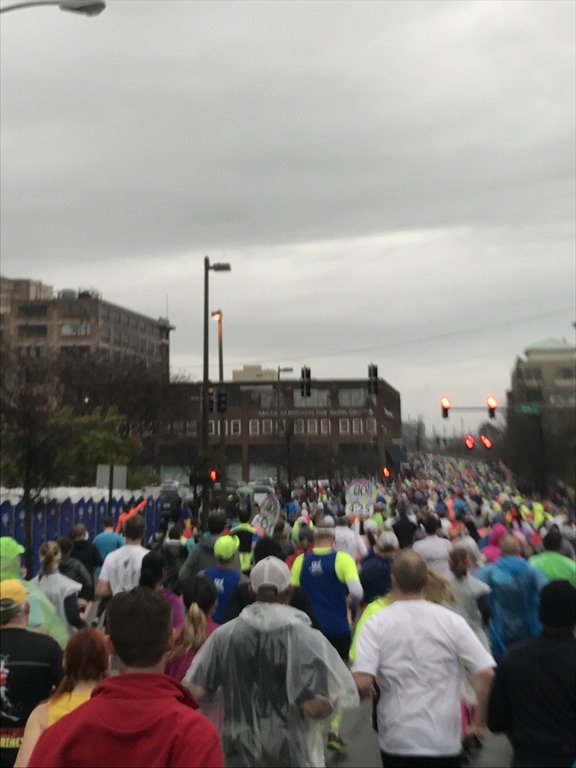 The course had changed since I had ran in 2014. I didn’t really know what to expect and was kinda okay with that. 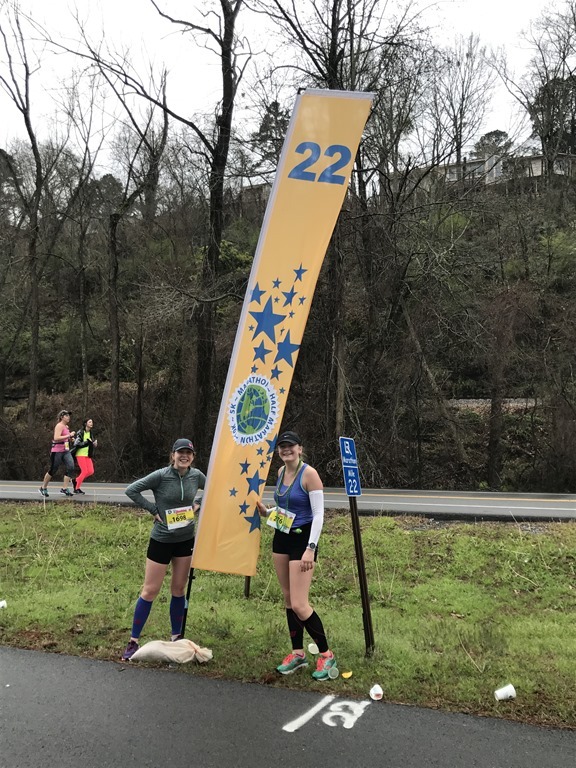 This was my 39th marathon, 2nd time at Little Rock. I kinda enjoy just running the course and enjoying it for what it presents. 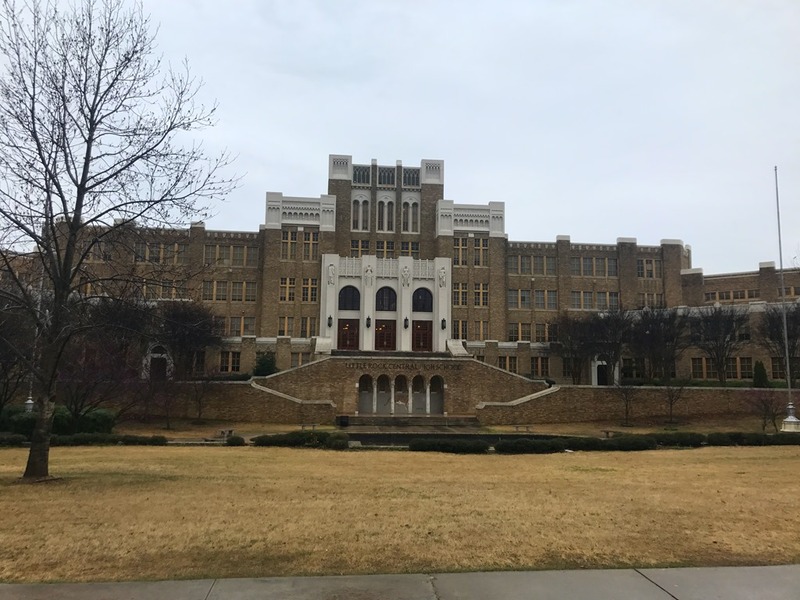 We headed over to North Little Rock first, looped around. Ran over a few bridges (steep inclines & declines, yes, please!). The girls were calm. We all agreed that we didn’t feel awesome but we didn’t feel horrible and that’s a pretty sweet spot to be in on marathon day. It curbs expectation but also delivers a bit of hope. Patience is the name of the game. You must be patient in the marathon or you’ll have a very bad day. The rain continued. Light but steady. People were complaining. 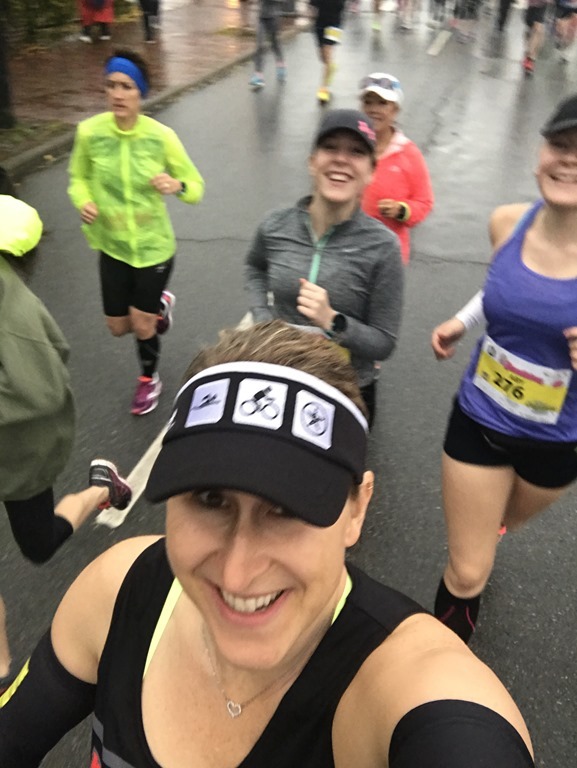 We just ran past them & pulled our hats/visors a little lower to block out the rain & wind. 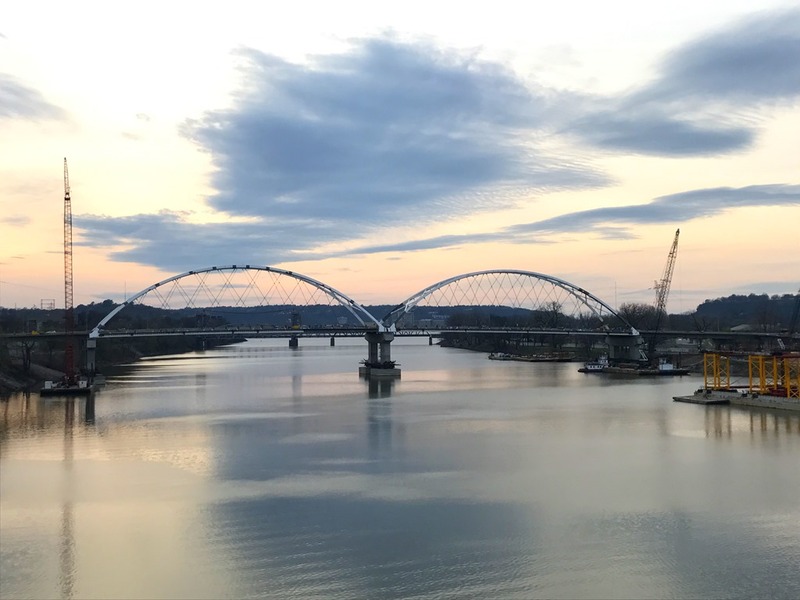 Back over the bridge into downtown Little Rock. Over the trolley tracks. I tripped but didn’t fall. We laughed. Down Market Street, along the Arkansas River, around the Heifer International campus. And then back thru town, up a few hills. Then I recognized a street from last time and knew the Governor’s Mansion was coming up. Aby had asked me 100 several times by this point if the Governor would be out. I didn’t know but was hoping so & sure enough, I could see his guards flanking him from pretty far down the street. I pointed out who he was (verses the guards) and the girls ran right up to him for a photo. 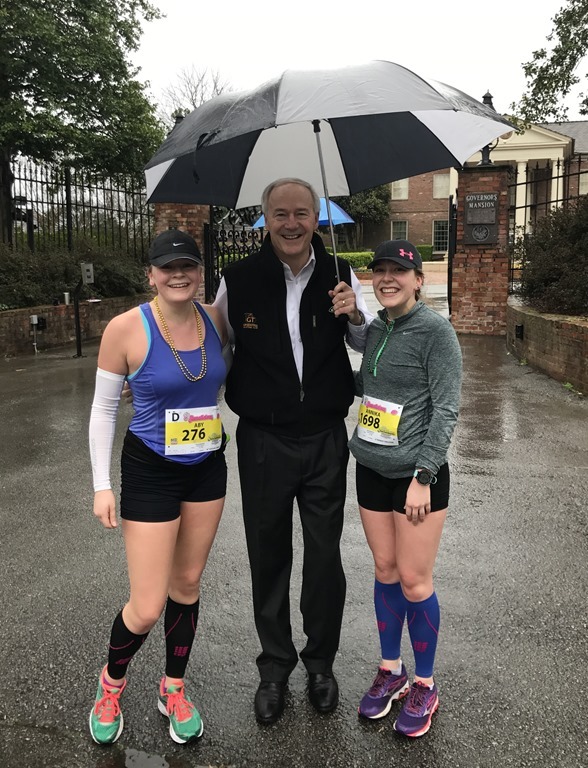 Thanks for standing out in the rain, Governor Hutchinson, you made their day! My favorite part of the course – Miles 14-17: Hillcrest area, Kavanaugh Boulevard, North Lookout Road & Alsopp Park. Breathtaking area. Aby & Annika running relaxed & easy between mile 16 & 17. After we left Alsopp Park, reality hit as we entered an out and back loop along Riverfront Drive. The out & back covers miles 18-23. I knew if something were going to go wrong, it would be in this section. Not only is it boring but very windy because its along the river & a little daunting because you can see the runners in front of you coming back while you have seemingly “forever” until the turnaround. This section is mentally exhausting but the girls looked strong. Aby was starting to get antsy. The 4:30 pacer crept up on us and we ran with her for awhile. Aby was not happy. She wanted to be IN FRONT of the 4:30 pacer. Annika said, “who cares!”. LOL! But Aby really did not want to let her pass. The pacer was only running with one other person so we ran with her for a while. It was entertaining because everyone had something to say as she passed them. Many, like Aby, were not happy. “Oh no!” was the common remark as she passed. I told her it was like running with the Angel of Death. Nobody was happy to see her that late in the game. I asked if she was on pace, and she was ahead of pace. 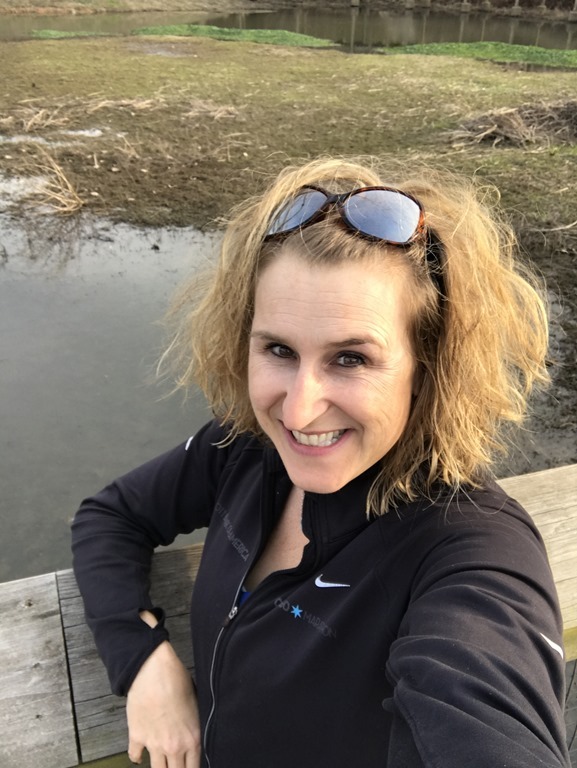 She was planning to stop & walk at mile 20 to get back on track. We stayed in her vicinity until she walked. I didn’t want to stop at mile 20 but rather push on to mile 22 for our last “pit stop”. Then I knew that we would be pushing to the finish. After 22, it was heads down. The pace was getting progressively faster but I knew there was a hill at mile 24 that was super ugly & would probably slow us down. So I just let it go. They looked good, hadn’t blown up, were well fueled, looking to run faster & well, I figured I had done my job at that point. If something happened in the last 4 miles, we’d just deal with it. And I’m happy to report, no blow ups. They killed it!!! The Lipstick Station at mile 26 was on the opposite side of the road this time, so I almost missed it. I went back to grab lipstick for us, sending the girls on and it was a sprint to the finish for them. 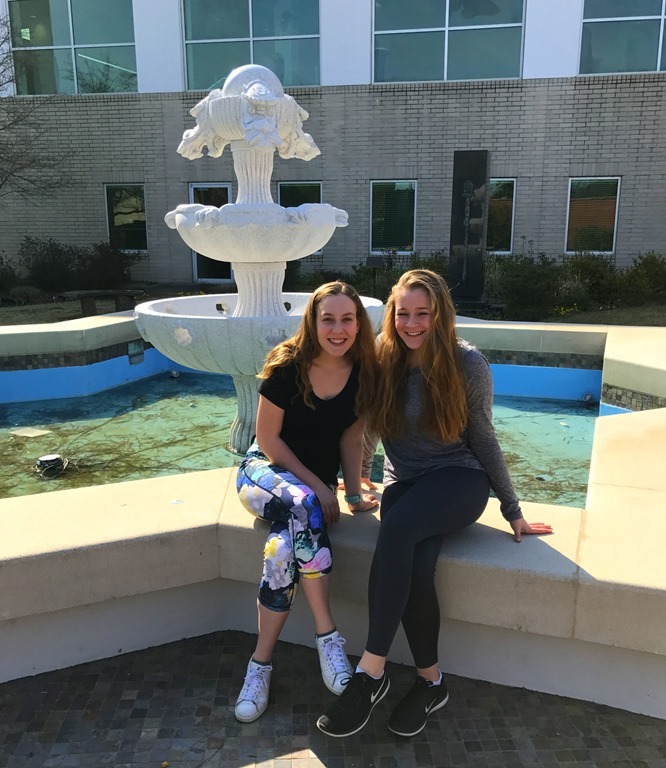 Great job, ladies. 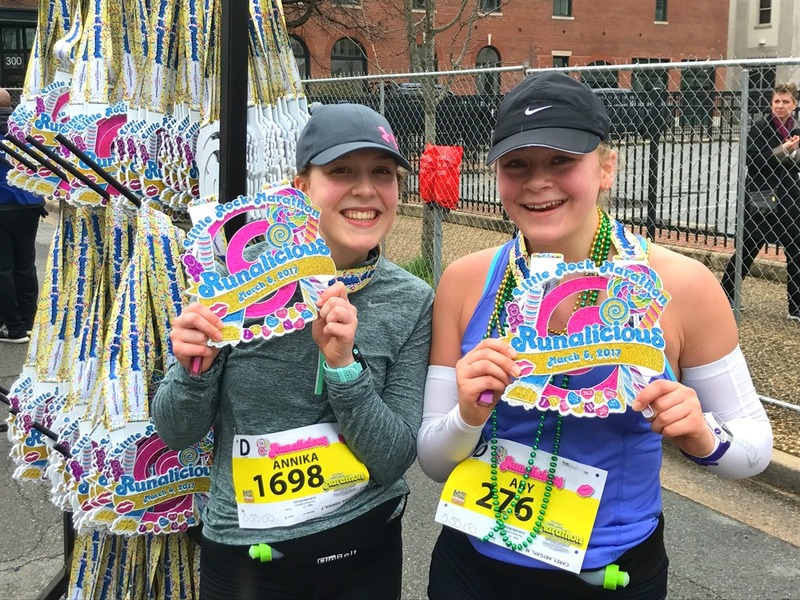 1 & 2 in their age group (15-19). Awesome race. Lots of crowd support. Volunteers, police & everyone seemed happy that we were there. Sometimes when a marathon rolls into a town, the residents aren’t happy because it’s a huge inconvenience for them. I genuinely feel welcome each time I go to Little Rock. If you are looking for a smaller race that feels like home, this is a great one. Elevation is much greater on the 2nd half, so save something for the bigger hills. There were 3 hills that were bad enough that we walked part of them but otherwise, we ran the entire race other than potty stops (2) and the photos we took. It was a great day in Little Rock & I’d be happy to go back. 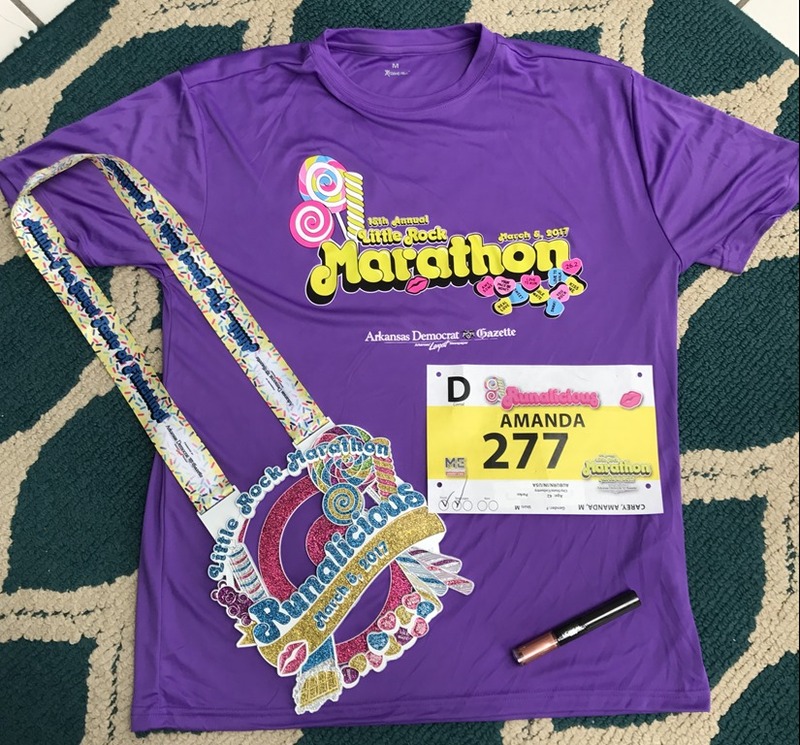 SWAG was a unisex race shirt & lipstick (if you grabbed it at mile 26) and a medal that’s heavy and bigger than your head. For those of you who ran 2014, I’ve added the two medals together for comparison. They are both over 2#s and I can’t hang them with my other medals for fear of pulling down the rack/rod. Details on the 2014 Little Rock Marathon HERE. 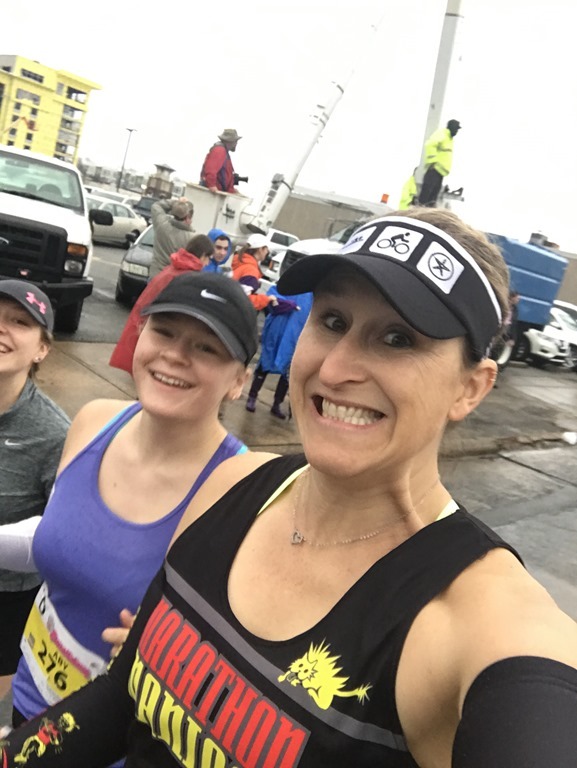 This entry was posted in Race Reviews, Running and tagged Arkansas Marathon, Little Rock Marathon, Marathon, Marathon Maniac, Run, Run for Fun, Runalicious, Running, running in the rain, Running with Teens by tootallfritz. Bookmark the permalink. Congrats to you and especially to your girls! Kudos to them for finishing #1 and #2 in their AGs. Are they excited to run another marathon? Those medals are whoppers!! Aby wants to run another after she is out of HS. It was a bit of a challenge trying to fit it in between XC & Track. 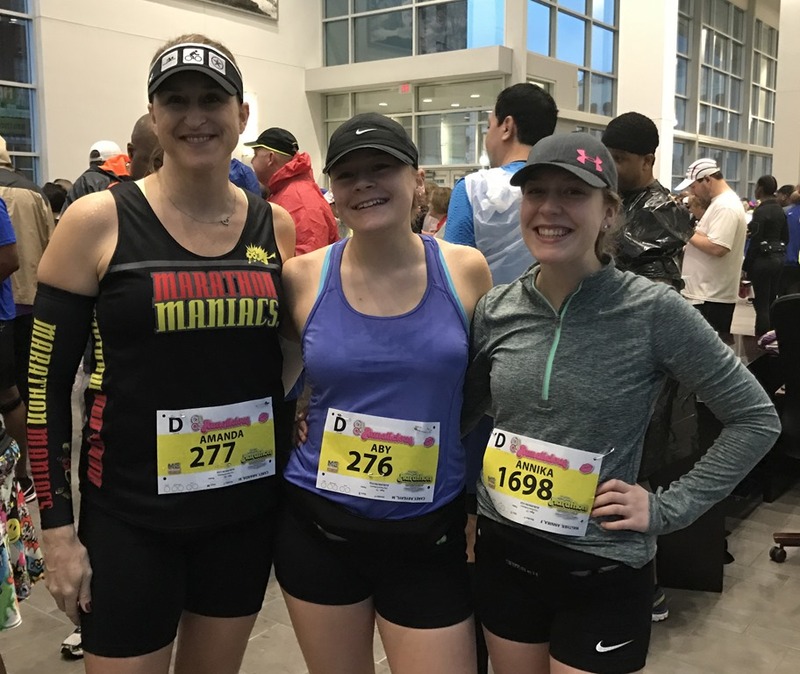 They bowed out of indoor season in order to train for the marathon. Thank you for coming to Little Rock. Due to weather, spectator participation was less but still a good run. 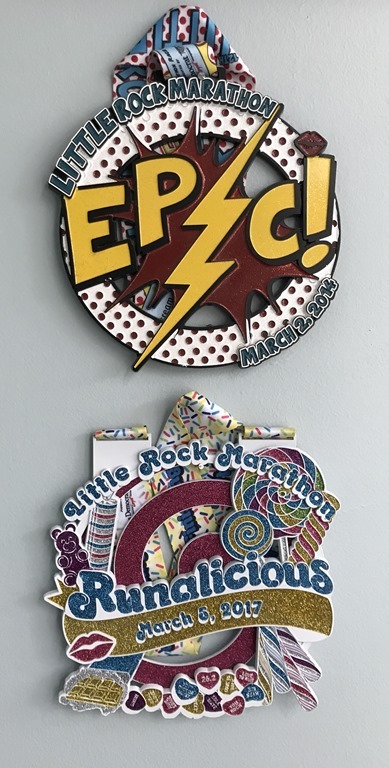 I did the Epic run in 2014 but usually do the half. 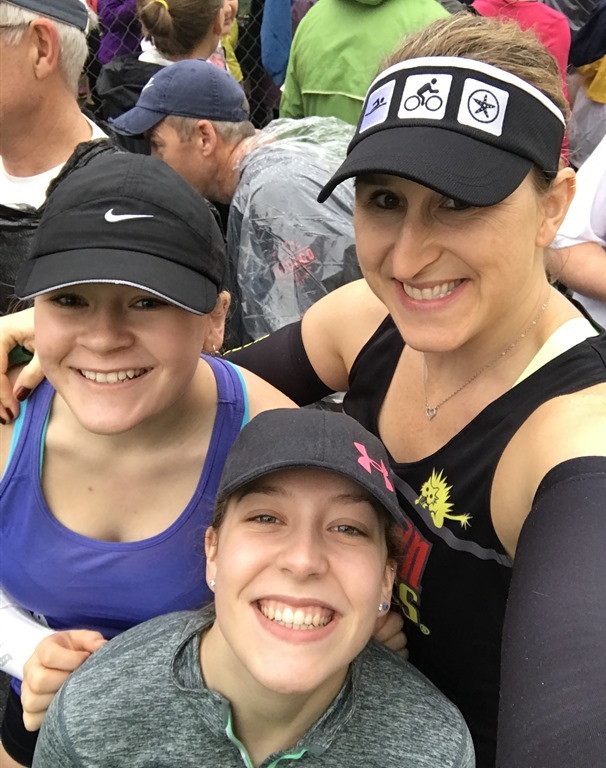 Did the 10k also with my family so it’s a very rewarding experience. Next time do the Combo for the 3rd medal. Awesome race! Thanks for having us!! Wow what a huge medal. What is the size and weight please?